Yet another card for Operation Write Home! 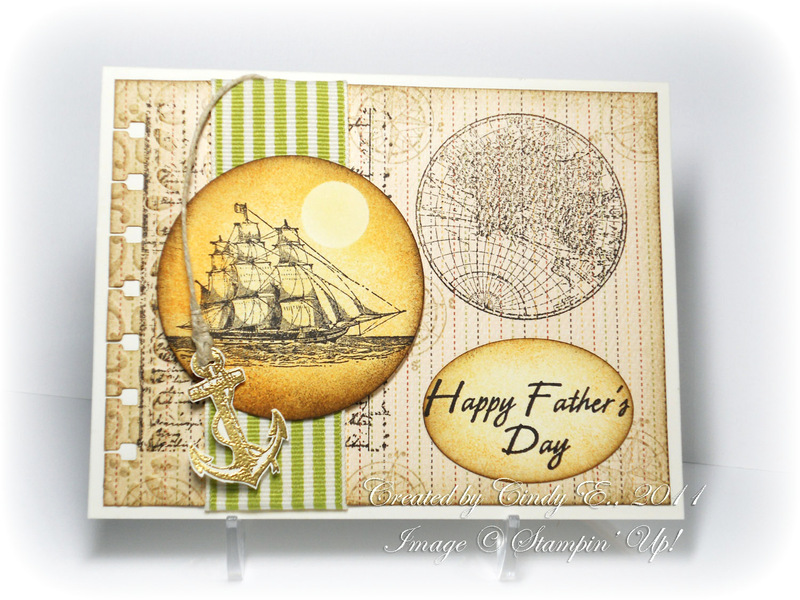 I so adore this new stamp set from Stampin' Up, called The Open Sea. My father is retired Navy, and I've always loved the old sailing ships from days gone by. We even have the world's oldest active sailing ship, an iron-hulled beauty called the Star of India, right here in San Diego! With the release of the latest Pirates of the Caribbean movie, I want to say "arrr" when I see these ships. Anyhoo, this stamp set is going to make those always-difficult masculine cards a whole lot easier now!!! I really hope this set will carry over into the new Idea Book & Catalog. Wowzers! That is truly a gorgeous man card! I too love ships... Any dad would be thrilled to receive this card. This is a real stunner Cindy. Thanks for giving me an idea how I can use some of that wide ribbon I have in my stash. Keeping you're family in my prayers. Congratulations postcard beautiful, Father's Day was probably successful, I greet. I question whether this is postcard bought or made ​​yourself? An awesome card, Cindy! Love the colors and the way you incorporated all the special touches.